It’s just a matter of time now and a few degree drop in the ocean temp. Dave Werner’s daughter Amalie with a keeper. Photo courtesy of Werner. Bob Nugent, hooked up on the bow. We’re all excited for when the larger bass come through next month. Photo courtesy Just Beneath the Surface. The keeper size for a striper is 28 inches and anglers are allowed to keep one per day unless the second fish is longer than 43 inches. The bass season in marine waters is from March 1 to Dec 31. And yes, we’ve had some epic bites the last week of December. “Right now NJ allows one fish 28 inches to under 43 inches and one over 43 inches. Most people keep these larger stripers as a trophy fish but those larger fish don’t even taste that good and they’re breeders. The 28 to 30-inch fish taste the best,” adds Werner. Striper fishing is a huge draw for our area. Photo courtesy of New Jersey Maritime Museum. 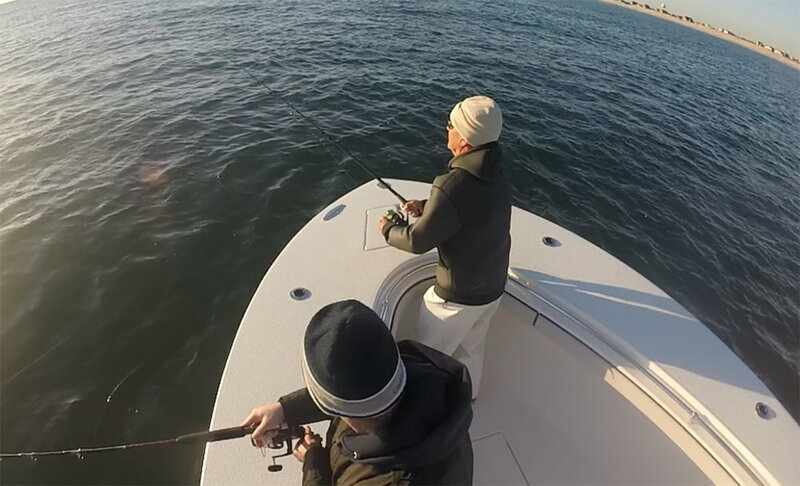 We respect the rules about commercial fishing and serving of striped bass but we love the recreational aspect. Photo courtesy of Just Beneath the Surface.